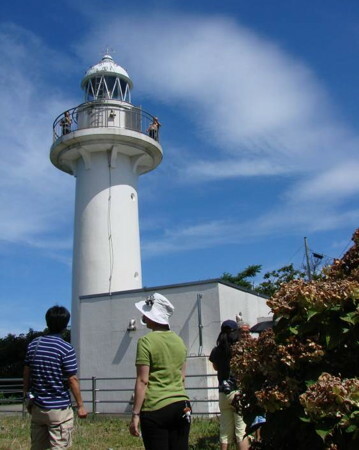 This page lists lighthouses of the mainland portion of the Japanese prefecture of Shimane, which faces the Sea of Japan on the far southwestern coast of Honshū. This is a rugged and beautiful coast, with many small ports but only a few big ones. Hamada is the most important port in the prefecture. Note: There is a separate page for the Oki Islands, which are also part of Shimane prefecture. In Japanese, the word for a lighthouse is tōdai or toudai (灯台). The words saki and misaki are for capes and headlands, shima (also spelled sima or jima) is an island, wan is a bay, and kō is a harbor. Lighthouses in Japan are operated and maintained by the Japanese Coast Guard's Maritime Safety Agency. On Honshū there is at least one Coast Guard Section Office in each prefecture, often two or more. Shimane has one office at Hamada, but lights in the eastern half of the prefecture are maintained by the office at Sakai, just over the border in Tottori Prefecture. A note on the Sea of Japan/East Sea controversy: The Directory takes no side in any international dispute; it makes use of the terminology, names, and spellings as they currently exist in each area covered. The sea between Japan and Korea is called the Sea of Japan on the pages for Japan and the East Sea on the pages for Korea. Excellent photos with notes (in Japanese) for many of the lighthouses. 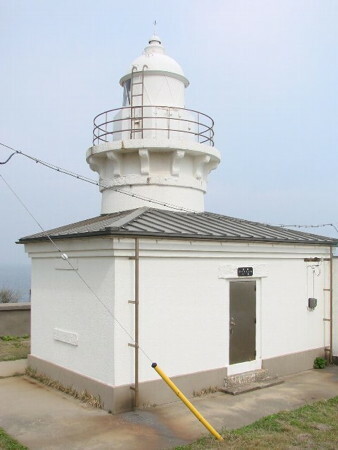 Another site with many photos of Japanese lighthouses, cited below as FOAL. 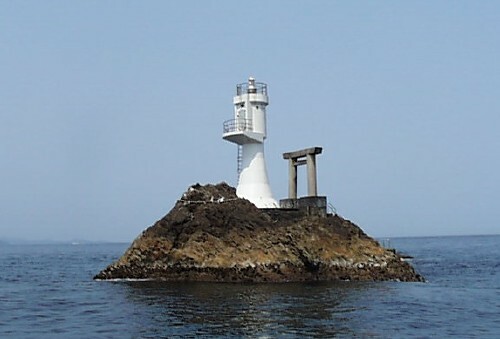 This site has many excellent photos of Japanese lighthouses. Another fine source of lighthouse photos. 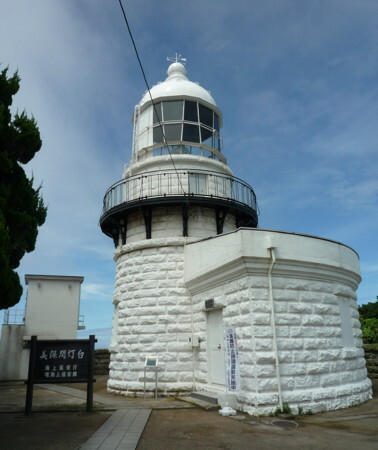 A comprehensive site for photos of Japanese lighthouses. Photos and a few notes for lighthouses in all parts of the country. Photos and data for the major lighthouses maintained by the Hamada Coast Guard Office. Photos posted by the Sakai Coast Guard Office. Historic postcard images posted by Klaus Huelse. Date unknown. Active; focal plane 15 m (49 ft); continuous red light with two more intense flashes every 10 s. 9.5 m (31 ft) concrete post attached to a 1-story square concrete equipment shelter. Entire structure is red. Google has a street view and a satellite view. Located on the north (main) breakwater of Iinoura harbor. Probably accessible by walking the pier. Site open, tower closed. ARLHS JPN-1553; JCG-0783; Admiralty M7357; NGA 1800. 1954. Active; focal plane 34 m (112 ft); white light, 3 s on, 3 s off. 11 m (36 ft) round concrete tower centered on a 1-story square concrete equipment building. Entire lighthouse is white. Lighthouse-Japan.com has a page with several photos, Lighthouse Visit also has a page with photos, and Google has a satellite view. Located on a promontory about 10 km (6 mi) north of Masuda. Accessible by a popular trail, but some local knowledge may be needed to find the location. Site status unknown. ARLHS JPN-718; JCG-0785; Admiralty M7354; NGA 1812. Date unknown. Active; focal plane 126 m (413 ft); white flash every 8 s. 15 m (49 ft) round cylindrical concrete tower with lantern and gallery. Entire lighthouse is white. A Coast Guard photo is at right, and Google has a satellite view. Taka Shima is a small island 8 km (5 mi) offshore and 16 km (10 mi) north of Masuda. Accessible only by boat. Site status unknown. ARLHS JPN-824; JCG-0786; Admiralty M7352.4; NGA 1804. Date unknown. Active; focal plane 12 m (39 ft); continuous red light with a more intense flash every 6 s. 9.5 m (31 ft) concrete post attached to a square 1-story concrete equipment room. Entire lighthouse is red. Another photo is available, and Google has a satellite view and a distant street view. Located at the end of the west breakwater of Sutsu harbor, just west of the giant Misumi power plant. Accessible by walking the pier. Site open, tower closed. ARLHS JPN-1578; JCG-0787; Admiralty M7353; NGA 1816. Date unknown. Active; focal plane 18 m (59 ft); two white flashes every 5 s. 16 m (52 ft) slender round cylindrical concrete tower. Lighthouse painted black with one red horizontal band. Google has a satellite view. Located on a shoal about 500 m (0.3 mi) outside the outer breakwater of Hamada harbor. Accessible only by boat. Site open, tower closed. JCG-0789; Admiralty M7349; NGA 1828. Date unknown. Active; focal plane about 13 m (43 ft); red flash every 6 s. Approx. 9 m (30 ft) round cylindrical concrete tower with a flared top, attached to a 1-story concrete equipment shelter. Entire structure is red. Google has a satellite view. Located at the north end of a detached breakwater on the west side of Hamada harbor. Accessible only by boat. Site open, tower closed. JCG-0789.1; Admiralty M7349.1. 1975. Active; focal plane 13 m (43 ft); red light, 2 s on, 2 s off. 9.5 m (31 ft) round hourglass-shaped concrete tower. Entire structure is red. Lighthouse Visit has photos (last lighthouse in the page), and Google has a satellite view and a very distant street view. Located at the end of a short breakwater at the west end of Hamada harbor. Accessible by walking the pier. Site open, tower closed. ARLHS JPN-1550; JCG-0796; Admiralty M7351; NGA 1848. 1993. Active; focal plane 14 m (46 ft); continuous red light with two more intense flashes every 6 s. 9.5 m (31 ft) round cylindrical concrete tower with a flared top, attached to a 1-story concrete equipment shelter. Entire structure is red. This light is on the left in a panoramic view of the harbor, Lighthouse Visit has photos (halfway down the page), and Google has a satellite view and a distant street view. Located at the north end of the main breakwater on the west side of Hamada harbor. Accessible by walking the pier. Site open, tower closed. ARLHS JPN-1552; JCG-0793.5; Admiralty M7349.3; NGA 1838. Date unknown (1993?). Active; focal plane 14 m (46 ft); two green flashes every 6 s. 9.5 m (31 ft) round cylindrical concrete tower with a flared top, attached to a 1-story concrete equipment shelter. Entire structure is white. This light is second from the left in a panoramic view of the harbor, Lighthouse Visit has photos (lower third of the page), and Google has a satellite view and a distant street view. Located at the west end of a detached breakwater on the northwest side of Hamada harbor. Accessible only by boat. Site open, tower closed. ARLHS JPN-1551; JCG-0794; Admiralty M7349.15; NGA 1832. Date unknown. Active; focal plane 14 m (46 ft); red flash every 4 s. 9.5 m (31 ft) round cylindrical concrete tower with a flared top, attached to a 1-story concrete equipment shelter. Entire structure is red. This light is third from the left in a panoramic view of the harbor, and Google has a satellite view and a distant street view. Located at the north end of a detached inner breakwater at Hamada. Accessible only by boat. Site open, tower closed. JCG-0793; Admiralty M7349.2; NGA 1840. Date unknown. Active; focal plane 14 m (46 ft); green light, 3 s on, 3 s off; in addition, a continuous white spotlight (JCG-0692.1) illuminates a nearby reef. 9.5 m (31 ft) concrete post attached to a square 1-story concrete equipment room. Entire lighthouse is white. This light is on the right in a panoramic view of the harbor, while Google has a satellite view and a distant street view. Located at the west end of the original detached north breakwater of Hamada harbor. Accessible only by boat. Site open, tower closed. JCG-0792; Admiralty M7348.5; NGA 1844. 1898. Active; focal plane 34 m (112 ft); two white flashes every 12 s; in addition a continuous white spotlight (JCG-0791) illuminates a nearby reef. 10.5 m (31 ft) round brick tower, rising from a 1-story equipment building. Lighthouse painted white. The Coast Guard's photo is at right, Lighthouse Visit has a distant photo, and Google has a satellite view. Located on an island at the northern entrance to Hamada harbor. Accessible only by boat. Site status unknown. ARLHS JPN-713; JCG-0790; Admiralty M7348; NGA 1824. Date unknown. Active; focal plane 12 m (39 ft); continuous red light with a more intense flash every 6 s. 9.5 m (31 ft) concrete post attached to a square 1-story concrete equipment room. Entire lighthouse is red. Lighthouse Visit has a page for the light, and Google has a street view and a satellite view. Located on the south breakwater of Togane, a small fishing harbor about 10 km (6 mi) northeast of Hamada harbor. Accessible by walking the pier. Site open, tower closed. ARLHS JPN-1581; JCG-0798; Admiralty M7347.4; NGA 1852. 1974. Active; focal plane 72 m (236 ft); white flash every 10 s. 16 m (52 ft) round cylindrical concrete tower with lantern and gallery, attached to a 1-story equipment room. There is also a communications tower on the gallery. Entire lighthouse is white. Shugo Morita's 2012 photo is at the top of this page, Lighthouse-Japan.com has a page with good photos, the Coast Guard has a page for the lighthouse, Lighthouse Visit also has a page, Misty's Tour has another photo, FOAL has additional photos, and Google has a satellite view. This lighthouse stands atop one of the highest in a series of rocky promontories, separated by long sandy beaches, that punctuate this section of the coast. Located in a park about 10 km (6 mi) northeast of Hamada. Accessible by road and a short hiking trail; parking available. Site open, tower closed. ARLHS JPN-189; JCG-0799; Admiralty M7347; NGA 1856. 1960. Active; focal plane 65 m (213 ft); white light, 3 s on, 3 s off. 10.5 m (31 ft) square cylindrical concrete tower with double gallery. The light is atop the tower; in addition, a spotlight (JCG-0801) shines through a square window to illuminate the narrow harbor entrance. Entire lighthouse is white. A Coast Guard photo is at right, Lighthouse-Japan.com has a page with good photos, FOAL's page has photos, Lighthouse Visit has photos, Misty's Tour has another photo, and Google has a satellite view. Located on a steep promontory on the northeast side of Gōtsu. Accessible by road; parking is available but the entrance to the hilltop area is unmarked. Site open, tower closed. ARLHS JPN-071; JCG-0800; Admiralty M7346.5; NGA 1860. 1963. Active; focal plane 12 m (39 ft); continuous green light with a more intense flash every 6 s. 8.5 m (28 ft) concrete post attached to a 1-story square concrete equipment shelter. Entire structure is white. Lighthouse Visit has photos (second half of the page), FOAL has a distant view (top of the page), and Google has a street view and a satellite view. Located on the short east breakwater of Yonotsu harbor, a fishing port about 13 km (8 mi) northeast of Gōtsu. Accessible by walking the pier. Site open, tower closed. ARLHS JPN-1585; JCG-0804; Admiralty M7346.2; NGA 1872. 1958. Active; focal plane 68 m (223 ft); flash every 2 s, white or red depending on direction. 10 m (33 ft) round concrete tower attached to a square 1-story concrete equipment shelter. Entire lighthouse is white. Lighthouse-Japan.com has a page with photos, Lighthouse Visit has photos, FOAL's page has a closeup (halfway down the page), and Google has a satellite view. Entire lighthouse is white. Located on a forested promonotory north of the breakwater light. The entrance to the forest is marked. Site open, tower closed. ARLHS JPN-765; JCG-0803; Admiralty M7346; NGA 1868. 2013. Active; focal plane 13 m (43 ft); red flash every 3 s. 8 m (26 ft) concrete post attached to a small concrete equipment room. Entire lighthouse is red. Google has a satellite view. Located at the end of the detached west breakwater at the entrance to Nima harbor, a fishing port about 25 km (15 mi) northeast of Gōtsu. Accessible only by boat. Site open, tower closed. ARLHS JPN-1565; JCG-0805; Admiralty M7345; NGA 1876. Date unknown. Demolished in 2013. This was a 12 m (39 ft) concrete post attached to a square 1-story concrete equipment shelter. Entire lighthouse was white. Google has a satellite view showing an active light on a small post. In January 2013 the two Nima lights were deactivated and replaced by a new tower on the detached west breakwater (previous entry). Located on the north outer breakwater of Nima harbor, a fishing port about 25 km (15 mi) northeast of Gōtsu. JCG-0805. Date unknown. Demolished in 2013. This was a 10 m (33 ft) round concrete tower centered on a 1-story round concrete base. Entire structure was white. Google has a satellite view showing a small post, possibly with a light. Located on the east breakwater of Nima harbor. Accessible by walking the pier. Site open, tower closed. ARLHS JPN-1564; ex-JCG-0806; ex-Admiralty M7344; ex-NGA 1880. 2010. Active; focal plane 14 m (46 ft); red flash every 4 s. 9 m (30 ft) concrete post attached to a square 1-story concrete equipment shelter. The entire lighthouse is red. Google has a street view and a satellite view. In 2010 the former lights at Isotake were replaced by this new light. FOAL's October 2010 photo was taken during this project. Located on a detached breakwater at Isotake harbor. Accessible only by boat. Site open, tower closed. ARLHS JPN-1554; JCG-0808; Admiralty M7343; NGA 1892. 1959. Demolished in 2010. This was a 13 m (43 ft) round cylindrical concrete tower rising from a 1-story equipment shelter. Entire lighthouse was white. Google has a satellite view showing a small post, which apparently does have a light. Formerly located at the end of the west (main) breakwater of Isotake, about 10 km (6 mi) west of Ōda city. Site open. ex-JCG-0808; ex-Admiralty M7343; ex-NGA 1892. 1959. 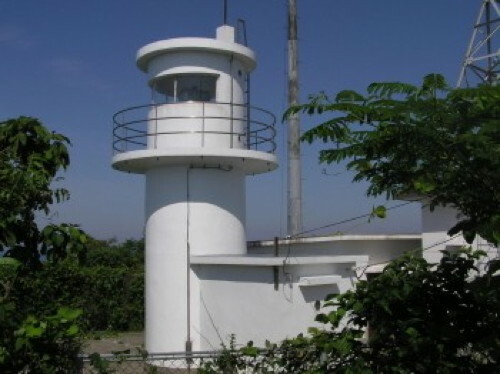 Active; focal plane 69 m (226 ft); white flash every 6 s. 14.5 m (48 ft) round concrete tower with lantern and gallery, attached to a 1-story keeper's house. Entire lighthouse is white. A Coast Guard photo is at right, the Coast Guard has a page with another photo, Lighthouse-Japan.com has a page with photos, FOAL's page has photos, Lighthouse Visit has photos (lower half of the page), a 2017 photo is available, Misty's Tour has another good photo, and Google has a satellite view. Local school children created and buried a time capsule at the lighthouse to celebrate its 50th anniversary in 1999. Located on a summit on the north side of Isotake harbor. Site open, tower closed. ARLHS JPN-446; JCG-0810; Admiralty M7342; NGA 1888. 2015. Active; focal plane 13 m (43 ft); green flash every 3 s. 8.5 m (28 ft) concrete post attached to a small concrete equipment room. Entire lighthouse is white. Google has a satellite view of the new location. In 2015 the two Kute breakwater lights were replaced by this new light. Located at the end of the detached west breakwater at the entrance to Kute harbor. Accessible only by boat. Site open, tower closed. ARLHS JPN-1560; JCG-0813; Admiralty M7341.2; NGA 1912. 1968. Removed in 2015. This was a 9.5 m (31 ft) concrete post attached to a 1-story square concrete equipment shelter. Entire structure was red. FOAL's page has photos, and Google has a satellite view and a distant street view. Formerly located on the west breakwater of Kute. Accessible by walking the pier. Site open. ARLHS JPN-1561; ex-JCG-0814; ex-Admiralty M7341; NGA 1904. Date unknown. Removed in 2015. This was a 8.5 m (28 ft) round hourglass-shaped concrete tower. Entire structure was white. FOAL's page has photos, and Google has a satellite view and a distant street view. Formerly located on the north breakwater of Kute, which appears to be detached. Accessible only by boat. Site open. ex-JCG-0813; ex-Admiralty M7341.2; ex-NGA 1912. 1951. Active; focal plane 93 m (305 ft); four white flashes every 15 s. 10 m (33 ft) round hourglass-shaped concrete tower with gallery. Entire lighthouse is white. Lighthouse-Japan.com has a page with good photos, FOAL's page has a closeup and other photos, Lighthouse Visit also has photos (middle of the page), the Coast Guard has a page with a distant view, another distant view is available, and Google has a satellite view. Located on a steep, forested promontory just north of Hane harbor. Hard to find; the Lighthouse-Japan webmaster had great difficulty finding a path to the light. Site open, tower closed. ARLHS JPN-629; JCG-0817; Admiralty M7338; NGA 1916. Note: The north coast of Shimane features a steep, forested ridge 65 km (40 mi) long, with the west half of the ridge in Izumo City and the east half in Matsue City. Both ends of the ridge project into the sea forming prominent capes. These capes are the sites of Shimane's best-known lighthouses, Hinomisaki in the west and Mihonoseki in the east. 1988. Active; focal plane 13 m (43 ft); red flash every 4 s. 8.5 m (28 ft) concrete post light attached to a 1-story square concrete equipment shelter. Entire structure is red. FOAL's page has photos, Lighthouse Visit has photos, and Google has a distant street view and a satellite view. Taisha Kō is a small boat harbor on the northwest side of Izumo city. Located at an elbow of the east breakwater, marking the entrance to Taisha harbor. Accessible by walking the pier. Site open, tower closed. ARLHS JPN-1579; JCG-0819; Admiralty M7336.4; NGA 1928. Date unknown. Active; focal plane 13 m (43 ft); green flash every 4 s. 10 m (33 ft) concrete post light attached to a 1-story square concrete equipment shelter. Entire structure is white. FOAL's page has photos, Lighthouse Visit has photos, and Google has a satellite view and a very distant street view. Located at the south end of the detached outer breakwater of Taisha harbor. Accessible only by boat. Site open, tower closed. ARLHS JPN-1580; JCG-0818; Admiralty M7337; NGA 1932. 1903. Active; focal plane 63 m (207 ft); two white flashes followed by one red flash every 20 s. 44 m (145 ft) round stone tower with lantern and gallery, attached to a 1-story keeper's house now used as a visitor center. Entire lighthouse painted white. A photo is at right, Nathan Dickworth has a photo, Lighthouse-Japan.com has a page with photos, a good 2008 photo is available, the Sakai Coast Guard Office has a web site for the lighthouse, FOAL's page has photos, Lighthouse Visit also has a page, Wikimedia has many photos, Klaus Huelse has a historic postcard view, Forand has a 1926 postcard view, and Google has a street view and a satellite view. This mighty tower is Japan's tallest lighthouse and certainly one of the country's most famous. It stands on a prominent and dangerous cape about 8 km (5 mi) west of the city of Izumo, marking shoals that extend westward from the cape into the Sea of Japan. Open to visitors, the tower is a very popular tourist attraction. Site open, tower open daily. ARLHS JPN-201; JCG-0821; Admiralty M7334; NGA 1936. 1973. Active; focal plane 36 m (118 ft); continuous white light. 13 m (43 ft) semicircular cylindrical white concrete tower; the light is shown through a window. This tower shines a spotlight on a dangerous reef just off the cape. Lighthouse Visit has photos (bottom of the page), FOAL has a photo (bottom of the page), and Google has a satellite view. 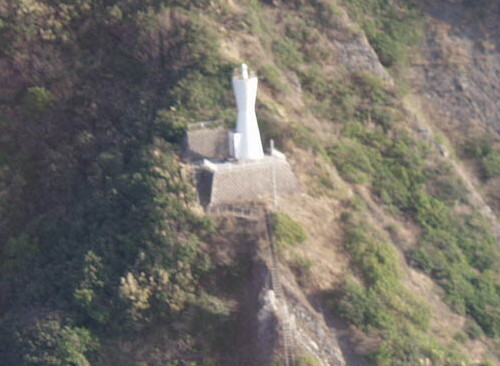 Located just northeast of the Hinomisaki lighthouse. Site open, tower closed. JCG-0822; Admiralty M7334.2. 1983. Active; focal plane 36 m (118 ft); continuous white light. 13 m (43 ft) round cylindrical white concrete tower. Shone through a square window, the light illuminates the narrow entrance to Uryu harbor. FOAL has photos (next to last row), Lighthouse Visit has photos, and Google has a satellite view. Located at the tip of a promontory on the west side of the harbor entrance. Site open, tower closed. JCG-0822.5; Admiralty M7335; NGA 1940. 1959. Active; focal plane 57 m (187 ft); white flash every 4 s. 8 m (26 ft) concrete post attached to a square 1-story concrete equipment shelter. Entire lighthouse is white. The Lighthouses in Japan site also has a page for the lighthouse, Lighthouse Visit has a photo, FOAL has additional photos (second row), and Google has a satellite view. Located on a promontory on the west side of the entrance to Sagiura Bay. Accessible by a fairly strenuous hiking trail. Site open, tower closed. ARLHS JPN-522; JCG-0824; Admiralty M7333.5; NGA 1944. Date unknown (station established 1984). Active; focal plane 13 m (43 ft); green light, 3 s on, 3 s off. 9.5 m (31 ft) round concrete tower, flared at the top, connected to a small equipment shelter. FOAL's page for the light has a good photo, Lighthouse Visit has a page with photos, and Google has a satellite view and a distant street view. Located at the end of the north breakwater at Uppurui. Accessible by walking the pier. Site open, tower closed. JCG-0825.5; Admiralty M7333.2; NGA 1952. 1957. Active; focal plane 65 m (213 ft); three white flashes every 13 s. 6 m (20 ft) round concrete tower with gallery, attached to a small equipment closet. Entire lighthouse is white. Lighthouse-Japan.com has a page with good photos, Lighthouse Visit has a page with photos (lower half of the page), additional photos are available, and Google has a satellite view. Located on a sharp, rocky promontory at the northern entrance to Izumo Bay, about 12 km (7.5 mi) north of the city. This site appears difficult to access. Site and tower closed. ARLHS JPN-720; JCG-0826; Admiralty M7333; NGA 1956. 1971. Active; focal plane 76 m (249 ft); white light, 3 s on, 3 s off. 10 m (33 ft) round hourglass-shaped concrete tower. Entire lighthouse is white. Lighthouse-Japan.com has a page with photos, FOAL has another page for the lighthouse, Lighthouse Visit also has a page, the Coast Guard has an page with two aerial views (including the one at right), and Google has a street view and a satellite view. Located on a bluff near Koizu, about 18 km (11 mi) west of Matsue. The light is above the coastal road and is accessible by a stiff climb up a long and rather scary flight of stairs. Site open, tower closed. ARLHS JPN-202; JCG-0827; Admiralty M7331; NGA 1960. 1977. Active; focal plane 12 m (39 ft); red flash every 3 s. 8.5 m (28 ft) round hourglass-shaped concrete tower. Entire lighthouse is red. FOAL's page has photos, Lighthouse Visit has photos (lower half of the page), and Google has a street view and a satellite view. Located at the end of the west breakwater at Koizu, a small harbor about 10 km (6 mi) due north of Izumo. Accessible by walking the pier. Site open, tower closed. ARLHS JPN-1558; JCG-0828; Admiralty M7331.5; NGA 1964. Date unknown. Active; focal plane 11 m (36 ft); continuous red light with a more intense flash every 6 s. 9.5 m (31 ft) concrete post attached to a square 1-story concrete equipment shelter. Entire lighthouse is red. Lighthouse Visit has a photo (last photo on the page), and Google has a satellite view and a distant street view. Located at the end of the south breakwater of Etomo, marking the entrance to the inner (traditional) harbor. Accessible by walking the pier. Site open, tower closed. JCG-0830; Admiralty M7328; NGA 1972. 1985. Active; focal plane 17 m (56 ft); green light, 3 s on, 3 s off. 14 m (46 ft) round cylindrical concrete tower with lantern and gallery. Entire lighthouse is white. FOAL's page for the Etomo harbor lighthouses has a photo, Lighthouse Visit has a photo, and Google has a street view and a satellite view. Located at the end of the west breakwater of Etomo harbor. Accessible by walking the pier. Site open, tower closed. ARLHS JPN-1567; JCG-0828.5; Admiralty M7327.5; NGA 1968. 1953. Active; focal plane 58 m (190 ft); white light, 5 s on, 3 s off. 9.5 m (31 ft) round concrete tower, rising from a 1-story square concrete equipment house. Entire lighthouse is white. Lighthouse-Japan.com has a page with good photos, Lighthouse Visit has a photo (halfway down the page), FOAL has photos (bottom of the page), and Google has an indistinct satellite view. Located on a promontory about 2.5 km (1.5 mi) north of Etomo. Apparently accessible by a hiking trail, but local knowledge will be needed. Site open, tower closed. ARLHS JPN-065; JCG-0833; Admiralty M7325; NGA 1976. 1967. Active; focal plane 13 m (43 ft); red light, 3 s on, 3 s off. 9.5 m (31 ft) concrete post attached to a 1-story square concrete equipment room. Entire lighthouse is red. FOAL has additional photos, Lighthouse Visit has a photo, and Google has a street view and a satellite view. Located at the end of the west breakwater of Mitsu harbor. Accessible by walking the pier. Site open, tower closed. ARLHS JPN-1563; JCG-0836; Admiralty M7324.6; NGA 1992. 1967(?). Active; focal plane 14 m (46 ft); green light, 3 s on, 3 s off. 9.5 m (31 ft) concrete post attached to a 1-story square concrete equipment room. Entire lighthouse is white. FOAL has additional photos, Lighthouse Visit has a photo, and Google has a street view and a satellite view. Located at the west end of a detached outer breakwater of Mitsu harbor. Accessible by walking the pier. Site open, tower closed. ARLHS JPN-1562; JCG-0836.5; Admiralty M7324.7; NGA 1988. Date unknown. Active; focal plane 13 m (43 ft); red flash every 3 s. 10 m (33 ft) concrete post attached to a 1-story concrete equipment room. Entire lighthouse is red. Lighthouse Visit has photos (lower half of the page), and Google has a satellite view and a distant street view. Located at the end of the north breakwater of Kaga port. Accessible by walking the pier. Site open, tower closed. ARLHS JPN-1556; JCG-837.5; Admiralty M7324.5; NGA 1996. 1952. Active; focal plane 34 m (112 ft); white light occulting once every 4 s. 10 m (33 ft) round cylindrical concrete tower attached to a square 1-story concrete equipment house. Entire lighthouse is white. Lighthouse-Japan.com has a page with good photos, FOAL's page also has good photos, Lighthouse Visit has photos, Yasumasa Miyake has a 2018 photo, Naohumi Morinaka has a view from the sea, Yuta Komura has a street view from the beach, and Google has a satellite view. This lighthouse occupies a popular viewpoint in what appears to be a nature reserve. Located on a promontory about 10 km (6 mi) north of Matsue. Accessible by a path from the end of the very narrow Sanami road north of Matsue. Site open, tower closed. ARLHS JPN-298; JCG-0837; Admiralty M7324.4; NGA 2000. 1952. 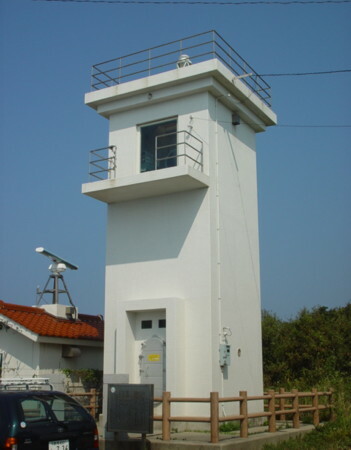 Active; focal plane 113 m (371 ft); white flash every 10 s. 7 m (23 ft) round cylindrical concrete tower attached to a small 1-story concrete equipment house. Entire lighthouse is white. 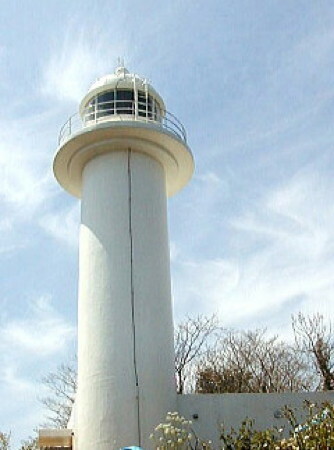 A larger square building adjoining the lighthouse carries a tall communications antenna. 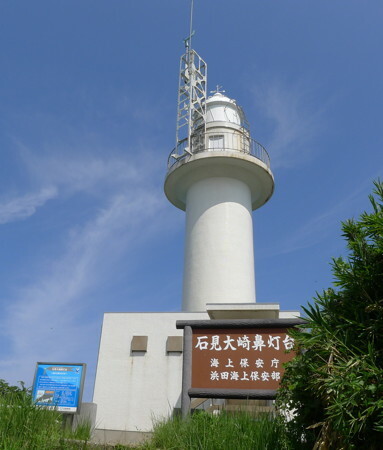 The lighthouse marks the northernmost point of the Shimane mainland. A Coast Guard photo is at right, Lighthouse-Japan.com has a page with a closeup photo, FOAL has a page of photos, Lighthouse Visit also has a page, Misty's Tour has another photo, and the lighthouse is visible in a Google satellite view. Located on a promontory about 11 km (6.5 mi) north northeast of Matsue. Accessible by road; parking is available close to the lighthouse. ARLHS JPN-621; JCG-0838; Admiralty M7324; NGA 2004. Date unknown. Active; focal plane 53 m (174 ft); continuous white light. 6 m (20 ft) square white concrete tower; the light is shown through a window. A photo is available, and Google has a satellite view. This tower has a powerful spotlight illuminating a nearby reef. Located about 2.5 km (1.5 mi) southeast of Tako Hana. Accessible by road, but the entrance is unmarked. Site open, tower closed. JCG-0839.5; Admiralty M7319.2. 1971. Active; focal plane 34 m (112 ft); white light occulting twice every 6 s; in addition, a continuous white spotlight (JCG-0842) illuminates the nearby Kuroshima reef. 10 m (33 ft) round cylindrical concrete tower. Entire lighthouse is white. This lighthouse is at the end of a long, forested peninsula; it may be accessible by hiking. Lighthouse-Japan.com has a page with good photos, FOAL has additional photos, Lighthouse Visit has photos (halfway down the page), and Google has a satellite view. Located about 5 km (3 mi) southeast of Tako Hana. Accessible by a hiking trail, but local knowledge will be needed. Site open, tower closed. ARLHS JPN-694; JCG-0841; Admiralty M7318.4; NGA 2012. Date unknown. Active; focal plane 45 m (148 ft); three white flashes every 13 s. In addition a continuous white spotlight (JCG-0844) illuminates the Fume Shima Beacon to the northeast. 11 m (36 ft) round cylindrical concrete tower, wider at the top, painted with red and white horizontal bands. Lighthouse Visit has a photo (first lighthouse on the page), a view from the sea is available, and the light appears in a Google satellite view. Located at the tip of a promontory sheltering the harbor of Shichurui, about 8 km (5 mi) west of Mihonoseki. Accessible by a hiking trail. Site open, tower closed. ARLHS JPN-590; JCG-0843; Admiralty M7314; NGA 2016. Date unknown. Active; focal plane 11 m (36 ft); continuous green light with a more intense flash every 5 s. 9.5 m (31 ft) concrete post attached to a 1-story square concrete equipment room. Entire lighthouse is white. Lighthouse Visit has a photo (third lighthouse on the page), and Google has a street view and a satellite view. Located at the north end of the detached breakwater at Shichiuri. Accessible only by boat, but there are good views from ferries sailing from Shichiuri to the Oki Islands. Site open, tower closed. ARLHS JPN-1574; JCG-0846; Admiralty M7315.2; NGA 2024. 1958. Active; focal plane 122 m (400 ft); white light, 3 s on, 3 s off. 7.5 m (25 ft) concrete post attached to a 1-story concrete equipment room. Entire lighthouse is white. Lighthouse Visit has a photo (last lighthouse on the page), another page for the lighthouse is available, and Google has a satellite view. Located on a promontory on the south side of the entrance to the harbor of Shichurui. Accessible by a hiking trail. Site open, tower closed. ARLHS JPN-1583; JCG-0847; Admiralty M7315; NGA 2020. 1898. Active; focal plane 83 m (272 ft); white flash every 12 s. 14 m (46 ft) round stone tower with lantern and gallery, attached to a semicircular stone keeper's cottage. Entire lighthouse painted white. 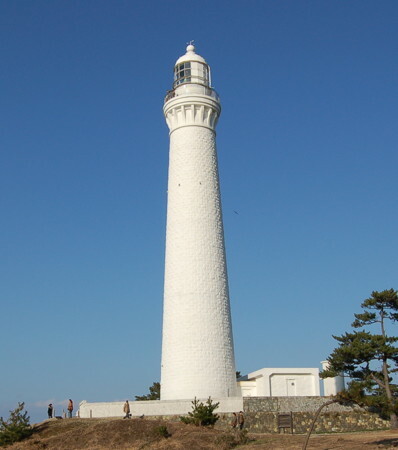 A photo appears at the top of this page, Lighthouse-Japan.com has a page with good photos, Lighthouse Visit also has a page for the lighthouse, another photo and a closeup of the lantern are available, Wikimedia has several photos, Klaus Huelse has a historic postcard view, Forand also has a postcard view, and Google has a fine satellite view. This historic lighthouse has an exceptionally scenic site, even for this scenic coast. It stands at Jizō Zaki, the end of a peninsula sheltering the harbor of Mihonoseki, with a wide view over water in three directions. A lighthouse museum has built built at the site; several Fresnel lenses including a first order lens (quite rare in Japan) are on display. FOAL's page for the lighthouse has photos of the lenses. Accessible by road, it is a very popular tourist attraction. Site open, tower closed but the lighthouse grounds and visitor center/museum are open. ARLHS JPN-349; JCG-0848; Admiralty M7316; NGA 2172. Date unknown. Active; focal plane about 72 m (236 ft); continuous white light. Approx. 5 m (17 ft) square concrete tower; the light is shown through a square window. This spotlight shines of the Okino Gozen Shima reef, which also has its own lighthouse (next entry). The Coast Guard has a photo (sixth photo on the page), Lighthouse Visit has photos (3/4 the way down the page), and FOAL has another photo (last photo on the page). Located next to the Mihonoseki lighthouse. Site open, tower closed. JCG-0849. Date unknown. Active; focal plane 14 m (46 ft); white flash every 3 s. 10 m (33 ft) round concrete tower with double gallery. Entire lighthouse is white. A Coast Guard photo is at right, Lighthouse Visit has photos (bottom of the page), FOAL has a distant view (last photo on the page), and Google has a satellite view. A Shinto shrine stands next to this remote light. Located on a dangerous skerry about 4 km (2.5 mi) northeast of Jizō Saki. Accessible only by boat. Site open, tower closed. ARLHS JPN-484; JCG-0850; Admiralty M7315.6; NGA 2168. Date unknown. Active; focal plane 12 m (39 ft); red flash every 3 s. 10 m (33 ft) round cylindrical concrete tower. Entire lighthouse is red. Lighthouse Visit has a page for the lighthouse, a closeup photo is available, and Google has a street view and a satellite view. This light is on the south side of the Mihonoseki peninsula; it guides vessels in the inner harbor of Sakaiminato, which is across a narrow channel in Tottori Prefecture. NGA misspells the name "Suraga." Located on a forested promontory; there seems to be no easy access. Site status unknown. ARLHS JPN-1577; JCG-0906; Admiralty M7304; NGA 2212. Note: The city of Yasugi faces north on Nakaumi, a brackish lake connected to the Sea of Japan by the Sakai Channel, a narrow inlet south of Mihonoseki. Nakaumi is separated from the sea by the city of Sakaiminato, which occupies the Yumigahama Peninsula in Tottori Prefecture. Date unknown. Active; focal plane 12 m (39 ft); white flash every 4 s. 8.5 m (28 ft) concrete post attached to a 1-story concrete equipment room. Entire lighthouse is white. Lighthouse Visit has a page for the light, a distant view is available, and Google has a satellite view and a distant street view. Located on a small island just off the waterfront of Yasugi. Accessible only by boat. Site status unknown. ARLHS JPN-1590; JCG-0914; Admiralty M7306; NGA 2192. 1962. Active; focal plane 9 m (30 ft); continuous red light with a more intense flash every 5 s. 8.5 m (28 ft) round hourglass-shaped concrete tower. Entire lighthouse is red. Lighthouse Visit has photos (lower half of the page), Google has a good street view as well as a satellite view. Located on a short breakwater at the entrance to the traditional inner harbor of Yasugi. Accessible by walking the pier. Site open, tower closed. ARLHS JPN-1600; JCG-0916; Admiralty M7307; NGA 2196. Posted February 28, 2007. Checked and revised July 3, 2018. Lighthouses: 52. Site copyright 2018 Russ Rowlett and the University of North Carolina at Chapel Hill.